One of the most important big game hunting equipment is a pair of binoculars. The best night vision binoculars are one that meets all your needs, starting with the budget. It is very exhausting to search for your target in an expansive landscape for hours in the dark. However, you can increase your chances of success by using a suitable pair of night vision binoculars. There are a number of specifications that you must take into consideration when shopping for night vision binoculars. Your eyes will function exceptionally if you use a model that balances between quality and performance. The best way to choose the best optics is to know the specifications and single out a brand that has the ideal specs. Binoculars are identified by their magnification power and the diameter of their objective lenses. Therefore, a pair of 4×50 binoculars has a four-power magnification, and a front lens diameter of 50 mm. The size of the lens determines the binoculars’ light gathering ability. Increasing the lens size does certainly improve light transmission, but you should expect the binoculars to weigh more. Higher magnification power is not always convenient. Usually, night vision binoculars with a magnification power greater than 10X are problematic to use when hand held. This is so since you will have difficulties keeping the image steady. You should consider binoculars with a magnification of 10 or higher if you will be using a tripod. The ideal pair of binoculars should have a reliable magnification/objective lens configuration. To ensure adequate light gathering capability under low light, you must make sure that the objective lens diameter is at least five times higher than the magnification power, such as 5x50mm. This is referred to as the exit pupil, which offers a brighter image depending on the size. You need binoculars with better resolution or image sharpness. This attribute is determined by the quality of the lens. 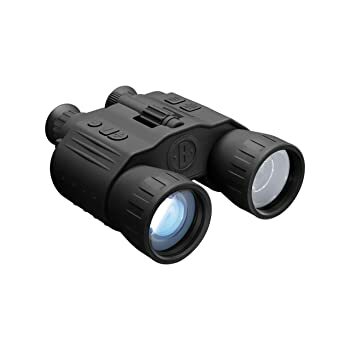 A pair of night vision binoculars with 4X magnification power with excellent image sharpness is more resourceful when compared to a pair of 8X magnification power with poor image sharpness. The best resolution indicators are lens quality and brand reputation. Light gathering capability is an important factor when relying on low light instead of IR illuminator. The light gathering ability of night vision binoculars depends on the exit pupil size (objective lens diameter divided by magnification power). The higher the exit pupil of the binoculars the better the light gathering ability; so, it is advisable to choose binoculars with an exit pupil of at least 5. Focus is an important factor to take into consideration when searching for night vision binoculars. Auto-focus binoculars do not center the image as per your preference. They are usually set for a fixed distance. You can customize focus for individual eyes if the binoculars have diopter adjustment focus setting system. To locate the diopter adjustment, look for a dial (+/-) or central focusing knob. You have to test the focus to see if it will work for you. Product Specifications: 4x50mm; 5x digital zoom; 7 degrees field of view; +/-1.8mm range of ocular adjustment; F=1.3; 8mm exit pupil distance & 12mm exit pupil diameter; 37.5mm focal distance; 850nm infrared illuminator; 5 Megapixel CMOS sensor; 720P HD video; 3-5 hours runtime with IR & 9 hours runtime without IR; tripod mountable; and IPX4 water resistance standard. Description: Xikezan is the best night vision binoculars for hunting, sightseeing, surveillance, camping, and boating to mention a few. It is a day/night device that you can use to capture daytime images and videos. While the night pictures are of good quality, the daylight images are perfect. The inbuilt 850nm IR allows you to identify your target’s face at 300 meters distance in complete darkness. The pair is equipped with a complete list of state-of-the-art features that offer excellent image and video capturing performance. High resolution and outstanding optical clarity. Has a significantly long night vision range of 980 feet. Timer lapse function allows you to observe slow movements comfortably. IPX4 weatherproof rated, can withstand wet conditions remarkably. Images captured in daylight are high quality compared to the ones captured in complete darkness. Product Specifications: 2x24mm; 5mm exit pupil diameter; 850nm IR wavelength; in-built IR illuminator; central focusing; +/-5 diopter adjustment; 12mm eye relief; 1m minimum focusing distance; 44m @ 100m field of view; 25 degrees field of view; 1:1.36 relative aperture; 31.6mm lens focus; 72 hours runtime without IR & 20 hours runtime with IR; and IP65 level of protection. Description: The Firefield FF25023 Tracker is the best night vision binoculars for daytime and nighttime use. The inbuilt IR illuminator allows you to use the pair in complete darkness up to IR wavelength of 805nm. It is a high performing generation 1 device with improved resolution. Unlike traditional field glasses that have simple bodies, the Firefield has an ergonomically made rubberized body that is lightweight and weatherproof. You can bring it on long hunting expeditions and even use it under wet conditions. Has an ergonomically made rubberized design that is lightweight and weatherproof. Inbuilt IR illuminator allows you to pick a detailed image of your target at 150 meters. Its dual tube structure offers better and improved depth perception. It is one of the best hunting gifts you can get your hunting buddy. The IR illuminator range is limited to 150 meters. Product Specifications: 5x50mm; inbuilt IR illuminator; manual focus; 44 feet @ 200 feet field of view; 12.5 degrees field of view; 3.6 feet minimum focal distance; +/-4 diopter adjustment; 57 to 73 mm interocular distance; and 400nm to 900nm spectral sensitivity. 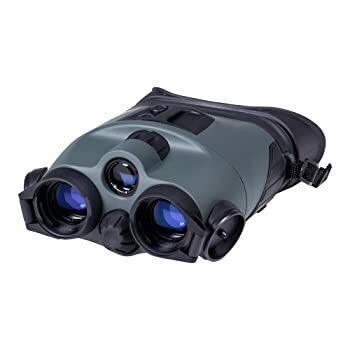 Description: Night Owl Pro Nexgen is the best night vision binoculars for spotting varmints. The device can zoom in targets up to 400 yards as long as you completely configure the manual focus. If you decide not to use the IR illuminator, you can capture finer images up to 200 yards if there is moonlight. You do not need more advanced binoculars if you can get your hands on these uniquely designed generation 1 binoculars. They are a bit heavy, weighing in at 2.4 pounds, but you can overlook the weight factor and enjoy the view. The powerful IR illuminator offers bright, clear and sharp images in total darkness. The best binoculars for hunting, surveillance, boating or camping. Better precision and control provided by two electronic intensifier tubes. You can buy it as a gift for your hunting partner. A little bit heavy for prolonged target viewing. Need to set up the focus every time you change position. Product Specifications: 2x24mm; 30 degrees FOV; 200 yards detection distance; +/-5 diopter adjustment; 1 yard to infinity focus range; resolution of 32-36 lp/mm; IR illumination of up to 150 yards; runtime of up to 20 hours; and operating temperature range of -22 to-104 degrees. 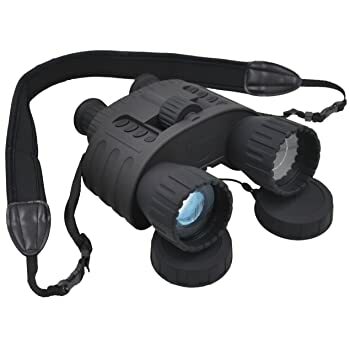 Description: The Yukon Tracker is the best night vision binoculars for hunting and nighttime surveillance. Regardless of the fact that it is a generation 1 device, the Yukon Tracker offers outstanding night vision viewing, which is remarkable for improved depth perception and constant viewing periods. The pair is equipped with a powerful built-in pulse IR illuminator, multicoated optics, central focusing, and eclipse protective lens covers for maximum viewing performance in total darkness. It has an ergonomically shaped and rubberized body that is lightweight and weatherproof. The powerful IR pulse illuminator lights up your target in complete darkness to provide a clear image. Has an ergonomic and rubberized body that is lightweight, weatherproof, and easy to operate. The best generation 1 binoculars for the money. You can conveniently transform the pair into daytime binoculars by closing the caps. It is quite an expensive piece considering its performance in the field. Product Specifications: 4x50mm; 4.4x-12.0x magnification w/ digital zoom; 229 m view range; 7 degrees field of view; +14 to +113 degrees Fahrenheit operating temperature range; CMOS sensor; multicoated optics; tripod mountable; and IPX4 water resistance standard. 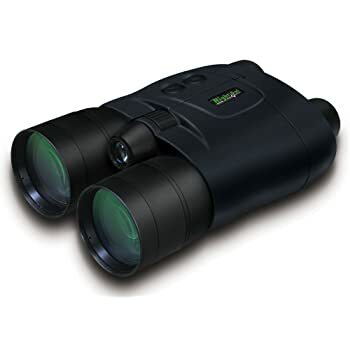 Description: Bushnell 260501 Equinox Series 6L is the best night vision binoculars for both day and night use. Installed with high quality optics and electronics, the pair is the most resourceful handheld digital NVD that uses infrared sensitive CMOS sensor, which provides better resolution and high quality image. 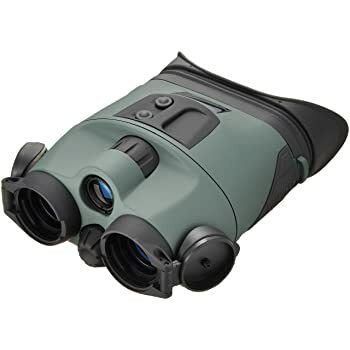 Unlike most traditional binoculars, this particular model is equipped with fully multicoated optics for improved light transmission that ensures there is minimal glare. The pair is highly resourceful and versatile. Apart from viewing targets in complete darkness, you can use them to capture images and videos and store them on the micro SD card. Fully multicoated optics reduce glare and increase light transmission. Highly user-friendly controls, you can set the device to achieve the most ideal configurations and position. The pair is tripod mountable. They have a rugged body, which is lightweight and highly weatherproof. They perform remarkably at night, but they are not so effective during the day. The best night vision binoculars are the ones that meet your needs and you can still afford them. As much as you want to buy a high performing pair, you should not forget about durability. You need a unit that is lightweight and ergonomic. The design has to be rubberized with reliable water resistance standard rate. Always test the binoculars before you purchase them. Even sophisticated night vision binoculars may be damaged during shipping. Thanks for this helpful post. Actually, I find it very hard to choose a good night vision binoculars. I have this perception that they are very complicated and that I should read a lot of articles about them first before I’ll go to a store. But, this post has cleared a lot of things up. I agree with you, if you do not even know what the specs mean with this type of product, you are not going to be getting the one that you need. You do a great job explaining that part of things. I am going to check reviews on some of these as I am curious.